Bordeaux is a responsive HTML restaurant template created by Orange Themes and featured at ThemeForest. This beautiful, elegant theme can also be used as a responsive HTML cafe template. The first thing you will notice about Bordeaux is that is has a gorgeous, unique design. The layout is very elegant with a carefully chosen set of colors: several shades of warm brown with touches of passionate red. The backgrounds have interesting wood and leather patterns and give the whole layout an exquisite look. The homepage of this template features a wide slider where you can add photos and amaze your visitors with your delicious food the same minute they enter your website. 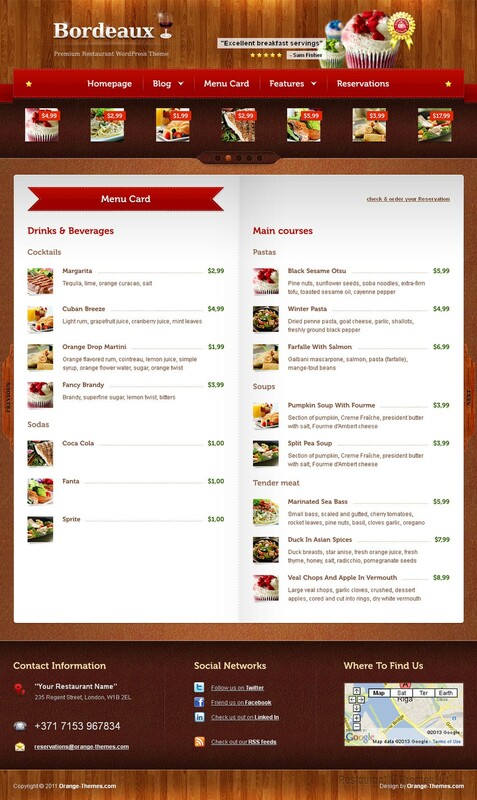 The template offers several menu style layouts and no matter which one you choose, you will be able to easily create a categorized, quality, great looking menu card. There are also several different blog and post styles you can choose from and make adapt the theme to your own needs and desires. Bordeaux features a simple table reservations form so your visitors can book a table on your website without even having to pick up the phone. You can feature your most popular menu offerings on your homepage, along with thumbnail photos of your delicacies and some teaser text. After clicking on any of these thumbnails your visitors will be taken to your menu card where they can read all about the meal that caught their eye. You will also be able to announce upcoming events on your homepage, and describe them thoroughly to your guests. Google Maps integration makes this theme even more useful, with exact directions of your restaurant shown right there on your website. Social integration is also nicely done, and you will be able to connect with the most popular social networks. Bordeaux is fully responsive and it will look great on any device. It will be easy for you to customize it because it comes with many shortcodes and a valid HTML code for easy customization. Bordeaux is also available as a WordPress theme.